Elizabeth Travis Johnson taught sewing for 34 years at Watkins College of Art, Design & Film in Nashville, then known as Watkins Institute. Situated above the old W.T. Grant store on Church Street, Watkins offered a 3-year sewing program. Students met 1-2 hours per week in the evenings, many of them mothers with small children. 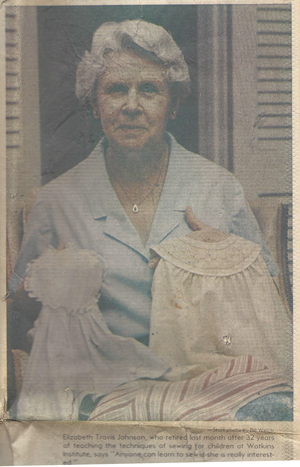 During the first year, students learned pattern drafting and French handsewing. In the second year, students added smocking (including picking up dots by hand). By year three, students learned to tailor a child’s coat, and they also brought their own projects and sewed with their close sewing friends. 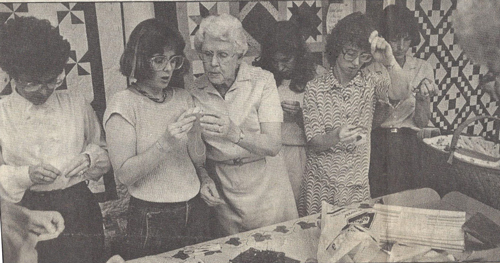 Watkins College continues to this day including a recent merger with Belmont University, though the sewing class was never the same without Mrs. Johnson. Mrs. Johnson also remembers when Watkins recruited her, having been a student of their sewing program, to become an instructor. “When they asked me to teach, I was thrilled. My husband, Glenn said ‘No,’ but I convinced him to let me try for one year just to get it out of my system.” That first year, in 1947, she recalled, “there was not much of an interest in smocking. It did not come into its own until the pleater came along. I had the very first one in Nashville. It was given to me as a present by my class and it cost $21.95.” Today, we use the same machine and they sell for several hundred dollars. 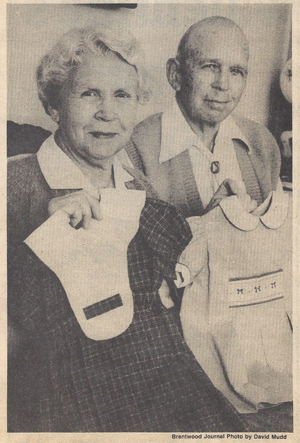 More than 50 of the earliest patterns in the Children’s Corner catalog were designed by Mrs. Johnson. She was instrumental in setting the foundation for the design aesthetic and rationale we are guided by today, 40 years later. We are honored and grateful for Mrs. Johnson’s contributions.